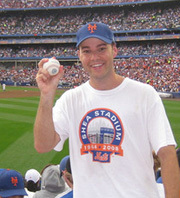 Zack Hample poses with his famous baseball. Tonight the Tampa Bay Rays face the Philadelphia Phillies in Game 3 of the World Series. More than 43,000 fans will be on hand to catch the game. And some will catch more than that: a foul ball, maybe a home run hit by Ryan Howard or Evan Longoria. There are a number of ways to catch a baseball at a game. Weekend America's Charlie Schroeder recently talked with one man who knows a thing or two about the art of getting baseballs at games. His name is Zack Hample, and he's the Babe Ruth of the bleachers. Some have even called him a baseball magnet. Whenever Zack Hample goes to a baseball game, he tries to get as many baseballs as he can. This year he snagged 539 balls while attending 72 games. He's gotten at least one ball in the last 568 games he's gone to and has over 3000 in his collection. Each ball has a story, but Zack can't tell you all of them. With him it's more quantity than quality. So how does he get so many baseballs? Mad skills and clever techniques. Like being able to ask for a ball in 33 different languages, like Spanish, Japanese and sign language. "I'm crazy and obsessive and dorky," he says. "I need some way to fill up my time so I don't turn into a drug addict." There are a couple different ways to get baseballs. There's the "easy way," like going before the game and begging a player to toss you a ball, and the hard way, like catching a ball during a game. A few weeks ago, Zack was at Yankee Stadium trying to do it the hard way. He was sitting in the right field bleachers when the Yankees first baseman, Jason Giambi, hit a home run. Zack caught it. To celebrate, he did a silly dance. "I guess the dance could be called the 'cabbage patch,'" he says. "Apparently it's an actual dance move from the '80s. Someone else described it as 'churning butter.'" Regardless, it made an impression on the announcers. The next night at Yankee Stadium, Zack was in the bleachers again. "I'd been hoping to catch a home run that whole game," he says. "I was even joking to people before I went to that game: 'Ha, ha, I'm going to make it two in a row tonight!'" In the eighth inning, the Yankees' left-fielder Johnny Damon knocked one deep to right field. It cleared the wall. Zack leaned over the railing and caught it. The announcers immediately recognized him. "Is that the same guy who caught the home run yesterday, off Jason Giambi?" Yankee play-by-play announcer Michael Kay asked. "Let's see, might be the same dance." Of course, it was. Because Zack was doing the cabbage patch. "The odds have to be astronomical that that would happen," Kay said. "To catch two in a season, let alone two on back-to-back nights." "Two in a lifetime!" color analyst Al Leiter chimed in. What Zack did was amazing, but he could have easily been remembered as that "back-to-back home run catching silly dance guy" if it weren't for what happened just a few days later. This time he was in the left field bleachers at Shea Stadium, home of the New York Mets. In the bottom of the sixth, the Mets centerfielder Carlos Beltran hit a high fly ball to deep left field. It took five seconds for the ball to travel from Beltran's bat to the bleachers where Zack was sitting. And by the time the ball cleared the wall, Zack was in position. "Everybody was tall," he says. "I felt like I was in a forest. And I just knew that I was going to have to elevate above the tallest tree." He stuck his glove in the air. Something hit it. "The ball was sitting there. I literally freaked out. It was just the ultimate celebration. I've never experienced a happier moment at a baseball game, ever." It was the last home run hit by a Met at Shea Stadium before the ballpark closed for good. People immediately began to speculate about its value. But for Zack this was a piece of history, and for a moment, the ultimate baseball collector had just one ball that really mattered. "I don't want there to be any separation between my skin and the flesh of that ball. I want to touch it and hold it. I might bow down to it. I haven't slept with it yet. But that ball is a treasure." At least until tomorrow night, when Zack plans on being in Philadelphia for Game 4. He'll be at the stadium early, and this time he's bringing two gloves.